Whiplash often results from a car accident, sports injury, or other incident in which a body is thrown suddenly forward and backward. Sometimes referred to as a “neck sprain,” it can cause significant pain and problems for sufferers. Most commonly, pain killers, rest, and physical therapy are prescribed for whiplash. 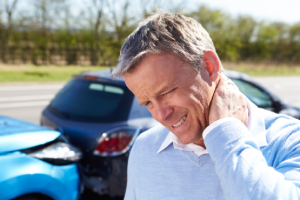 While painkillers and muscle relaxers may mask the symptoms of whiplash, chiropractic adjustments, in conjunction with physical therapy, massage therapy, and other treatment options can speed recovery and help promote total healing. Careful manipulation realigns the spine and joints, relieving pressure on nerves and helping to release painful tension in muscles. Here at Alpha Care, we care about our patients affected by whiplash-related pain and we want to help. Alpha Care’s friendly team and on-staff chiropractors are available for same day appointments in each of our four locations. No referrals are needed to make an appointment at Alpha Care. We provide the highest quality treatment for your pain using state of the art equipment. Find your new chiropractor or doctor at one of our four convenient locations or call us today at (843) 824-2273.